I recently made us some post pub grub, combining chilli and tortillas to create quesadilla’s. They were delicious! Fry the mince in a frying pan with the chilli and 1tsp of the seasoning until browned, spoon off any fat. Add the onion and pepper and cook for 5mins. Add 1tbsp of the seasoning and stir it through the mince and vegetables. Add the tomato sauce and bring to a simmer for 10-20mins until thickened. Add the beans for 5mins, until heated through. Set the pan aside and using a separate frying pan, heat the pan (without oil), then lay a tortilla in the bottom, spoon 1/4 of the mince mixture onto half the tortilla, spread evenly, top with grated cheese then fold in half, repeat this for the second tortilla. Fry for 1-2mins then turn and fry for another 1-2mins. Remove from the pan and keep warm, while repeating the above for the third and fourth quesadilla’s. Once both are cooked, serve with rice, salad and added extras of guacamole, soured cream and salsa. Gallery | This entry was posted in Recipes / Food and tagged chilli, Food, Mexican, Quesadilla, Recipe, Tortilla. Bookmark the permalink. Thanks – That looks delicious! Those look great! I love making quesadillas, though I usually make mine with thin slices of ham of some sort, and slice them into wedges for an easy tex-mex appetiser. They are lovely, easy, and addictive to boot! Thanks Veronika, they were scrummy! 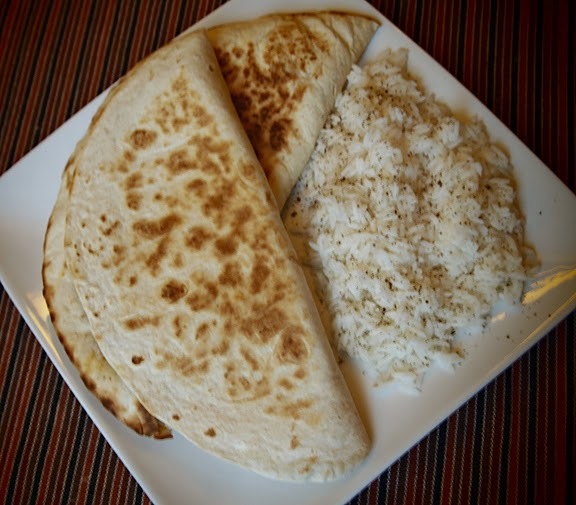 My friend made us veggie quesadilla’s recently…there’s so much you can do with this recipe.